For over forty years, AAHAM’s elite certification examinations have set the standard of excellence in patient financial services and the revenue cycle. AAHAM certifications are an investment in your personal growth and your professional future. Expertise – that you possess the knowledge to meet the industry’s highest standards and the capacity to pass a rigorous certification examination. • Continue to expand your skills and expertise through your commitment to continuing education. On October 16, 2013, AAHAM announced the enhancement of their certification program. Certification titles are being updated to reflect current industry standards. Also, a new level of certification is being added, the Certified Revenue Cycle Professional certification. This new exam is designed specifically for mid-level supervisory staff and managers. Formerly known as CPAM/CCAM, the CRCE exam possesses the highest level of difficulty combining content knowledge of the business with critical thinking and communication skills. It is comparable to earning a CPA or passing the bar exam. This exam represents the newest addition to our exam portfolio and is directed to the supervisor or manager level staff member. It requires in-depth knowledge of focused functional areas of the revenue cycle. Formerly known as CPAT/CCAT, this exam is directed to staff who have responsibilities in the revenue cycle with a focus on specific knowledge required in registration (front desk), billing and credit & collections. 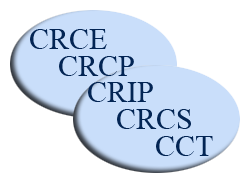 The CCT exam is intended to meet employers’ annual compliance training requirements and to support individuals with professional compliance responsibilities. The ninety minute, online, proctored CCT exam measures basic competencies in healthcare compliance. Visit AAHAM's National website @ www.aaham.org for more detailed information on each of these certifications.